We are in this advanced world, full of everything available at our fingertips. Going backwards is neither possible nor desired. Trying to force the self to stay away from the modern world is an excellent way to stagnate yourself and to buck the flow of energy. Therefore, the best way is to make the best use of it. 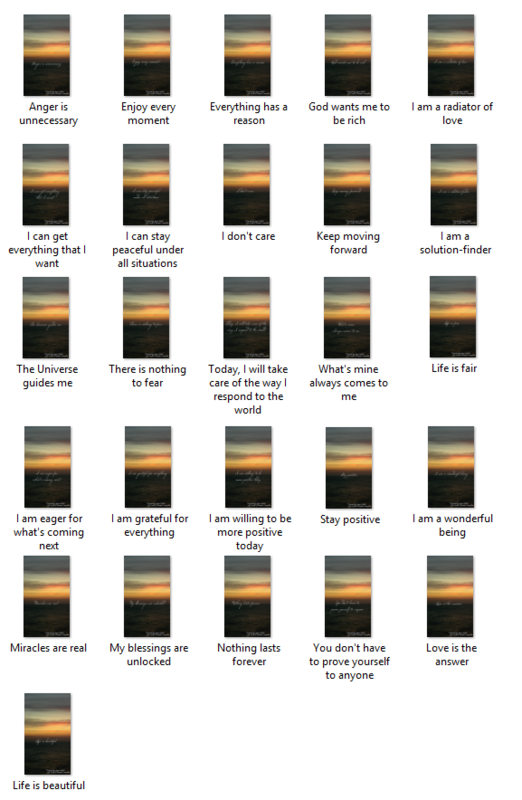 Here are Affirmations that you can put up on your Mobile Phone's Lock Screen. The advantage of setting them on the lock screen is that you end up glancing at them only for a few seconds (or sometimes just fractions of seconds), and not obsess over those words. That's an ultimate way to let them seep into your subconscious mind. The idea behind this Mind Exercise is to create an attraction pattern of positive experiences in your energy. Pro Tip: Randomize them. Change them once in a while... may be once every 15 days or so. These are high resolution images. To save the hosting space on my website, I have linked them on Google Photos. You can easily download as many as you like. I have linked the entire album below, and not individual photos. That would be too much of unnecessary donkey work! New Affirmations with new Background keep getting added. You can request for a specific affirmation by commenting it below. And yes, photos in the backgrounds of those Affirmations have been clicked by me. Feel FREE to share them with your dear ones.